First things first: Woo! Big Ten. Tides are turning people. 1-10... oh. I hesitate to say this team is bad, but they sure look bad. The team is completely out of sync, and maybe that's what happens when you lose your two senior guards and half the team can't legally drink. But either way, this team doesn't look like they have a lack of experience; they look like they have a lack of coaching and preparation. The offense is out of sorts and has absolutely no flow to it whatsoever. The team tries desperately for a backcut for 25 seconds and then someone throws up a contested three. On defense, the team is slow on rotations and out of position most of the time. It's getting ugly. Speaking of the offense, DeShawn Sims needs to get going. And not in that, he-needs-to start-hitting-shots way. 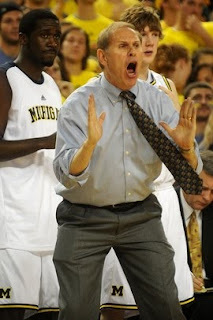 Beilein needs to put him squarely on the block and run the offense through him. For as good as Manny Harris is, the offense runs best when it's going inside and out, letting Sims work on the block. For a lot of the game Michigan had five players on the three-point arc and no movement. Everyone is waiting for something to happen. The ball needs to go to Sims on the block. And Harris: The most bothersome thing to come out of these early season losses is seeing just how far Manny Harris has to go. I was lamenting after the Alabama game that, even though Harris' stat line is great, he absolutely cannot take over games the way Michigan needs him too. His outside shot is still abysmal (it was bad last year, too, don't kid yourself), he makes bad decisions, forces the play too much, and is generally too easily shut down. You saw at the end of the game yesterday when he started clearing everyone out because he wanted the ball. And then he drove into three men and failed to kick the ball out. Great players make that play. Needless to say, I've cooled significantly on the Manny Harris As God meme. Michigan CANNOT rebound and will likely have to rethink their lineup against teams with anything resembling big men. Gibson/Sims/Harris/LLP (maybe Novak)/Morris seems the most likely starting five. Oh, and Michigan fans have clearly not bought into Michigan basketball yet. That turnout was embarrassing on national television. Evan Turner is far and away the best player in the Big Ten. Comparing Harris to Turner at this point is fruitless. There's no question as to who is better. And by a wide margin, too. Wisconsin is really good. They remind me of a less dynamic 2008 Louisville. Enormous--almost to a fault--athletic, and disciplined. By my early season estimation, Wisconsin will battle MSU for the Big Ten title this year. MSU might be the best team in the Big Ten (maybe) but is still not a national contender. Final Four? Maybe. MSU is exceedingly good at the fundamentals but doesn't have that extra gear. There are too many teams in college basketball right now that go above that into obvious excellence that Michigan State is looking at, probably, a deep exit in the tournament after being embarrassed and outmatched again. I spend about half of every Michigan game yelling "Put Zack Gibson in!" The five spot for twelve minutes (11.5 avg) is the only place where we seem ready to play ball. Actually, the one encouraging thing about the BC game was that Zack got to play, and Cronin saw the floor when Zack got into foul trouble. I think Beilein will get the team going. He's a great coach. He's short, though. Never trust a short coach. They're all flash. Fast breaks and lost rebounds. Don't respect the big men. Little Red Auerbach? Nine lousy championships. Fe-Fi-Phil Jackson? Ten and counting. Q.E.D.